Simply put, the x264 HD Benchmark is a reproducible measure of how fast your machine can encode a short HD-quality video clip into a high quality x264 video file. It’s nice because everyone running it will use the same video clip and software. 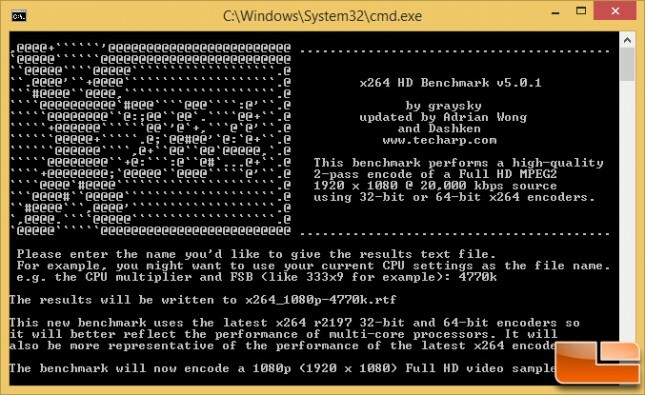 The video encoder (x264.exe) reports a fairly accurate internal benchmark (in frames per second) for each pass of the video encode and it also uses multi-core processors very efficiently. All these factors make this an ideal benchmark to compare different processors and systems to each other. We are using x264 HD v5.0.1 for this test. This application scales across many threads and is ideal for processors with Intel Hyper-Threading or a bunch of cores. 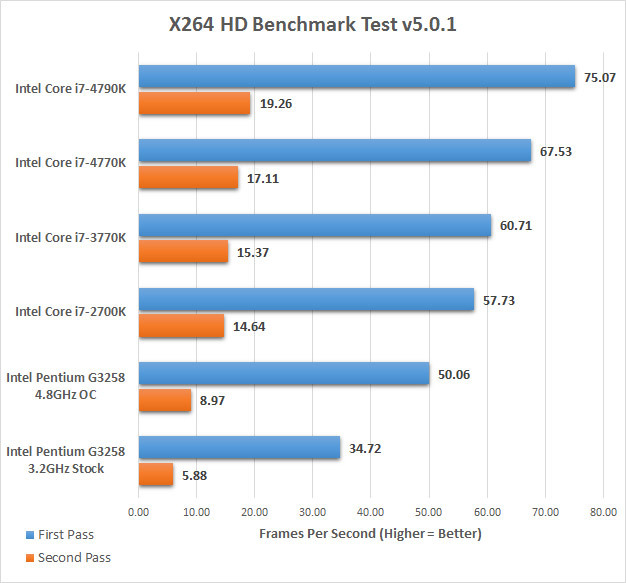 Benchmark Results: The x264 HD v5.0.1 benchmark showed the Intel Pentium G3258 was able to get 34.8 FPS on pass 1 and 5.9 FPS on pass 2. With the processor overclocked by 1.6GHz up to 4.8GHz we were able to get 50 FPS on pass 1 and 9 FPS on pass 2, which is roughly a 45% performance increase from our massive overclock. This overclock isn’t enough to catch up to the high-end quad-core processors in our charts, but these are solid results for a dual-core processor.